Your guide to some of the best and inviting food establishments. One criticism people raised down south (from the States) around Louisana often make when they see an establishment that’s not from the region and based out of another country is if the food is authentic, or are they trying to go for a schtick to get folks not from the region in? Memphis Blues BBQ faces that challenge. Can they convince a West Coast boy like me or cajole friends of mine, who are from the South (but moved here for a cooler climate or other reasons), that they truly did bring the tastes of the region up to the Pacific Northwest so they can be reminded of home? I know two: one born in Texas (she now lives up island) and a Facebook buddy who was from there. I discovered this place while in Vancouver for a concert and did not want to wander far from my hotel to sate certain cravings. I love ‘gator, crawfish and gumbo. This diner has one out of the three. Maybe on another visit, I can try Le Crocodile, a really expensive upscale place to make comparisons between budget and trendy. I’m okay with this franchise operation. I went to their lunch stop on Robson. Even active Fringers need a moment to snack in between shows. With the long weekend coming up, that may be tough to do as the time in between shows is at most 30 minutes. Where can folks go to refuel? Unless a timeout is used for a proper meal, nibbling in line is what I tend to do instead of sitting for a spell. The official event guide offers three places to hit. By showing your button, a 10% discount is applied, but one of these stops is for dine-in than take-out. Hardly many eateries are mentioned in this year’s booklet. I offer an expanded list for those looking for quick meals to have while waiting in line. This list is organized by close proximity to the venues. Sadly, not a lot of options exist within a short walking distance of Langham Court (Venue 5). Bubby Rose’s (1022 Cook Street) can satisfy with their pizzas and pastries, but on evenings when most of the shows take place during the weekday, they are closed. Cook St. Village proper is approximately 10 minutes away and not many folks are willing to run. For sweets like macaroons, La Roux Patisserie (519 Fisgard St), Fol Epi (732 Yates Street, they serve sandwiches too) and Empire Donuts (736 Yates Street, inside the mall) are worth the diversion to stop into. They provide ample recharge options for performers too if they have yet to find these two operations. Superbaba (1325 Blanshard), Efes (788 Yates) and Brickyard Pizza (784 Yates) are also viable options for warmer meals. All of them offer delicious toasted bites. My personal preference for Middle Eastern food is with Efes. Their döners always tickle my fancy over Superbaba’s shawarmas. As for falafels, the jury is still out. Sakura Grocery (1213 Quadra) is closer to The Metro on Quadra and VCM Wood Hall for those not wanting to venture far. While their sushi prices are mildly high, the extra cost is worth it! Standard staples like California, spicy tuna or salmon rolls are available can be found. This operation is under new management and the quality has vastly improved since my visits from years ago. Another option is a sandwich or pastry from the Deli in The Market on Yates (903 Yates). I always stop here for a drink as they have a huge variety to choose from. When bouncing between one side of town to another, a stop by The Dutch Bakery (718 Fort Street) for their pies is a must. These buttery delights are the reason why I’m rotund! The crust is oh so wonderful, and the window display of their many tarts … Oh my! Although this secret is mostly known to locals, Noodlebox (818 Douglas Street) has been the top pick for take-out for many an event in town—especially near the Inner Harbour. Their quality is great, and options include no spice to the extreme. Plus, you can dine-in too! This establishment is just one of two franchise operations worth mentioning. Beavertails (602 Broughton) for fried bread (with your choice of cinnamon or Nutella) or poutine is worth a stop. Over at Woodshed Restaurant, the pizzas are fired quick and they come out nice and hot! No, a slice has not burned my tongue, but to smell what’s coming from that roaster, especially with the right dish, is particularly mouth watering. I’ll usually hit this place first since it’s not far from the Mary Winspear Centre. When I’m there for an event, I’d rather not venture too far to get back here for the fun that’s to take place in the evening. I was here for Van Isle Comic Con, a terrific event that does not even try to copy others with high profile guests. They get comic book illustrators and people involved behind the scenes. I feel this show will go farther than Capital City. Their huge selling point is that entry is by donation and not motivated with revitalizing a stagnant city core! Woodshed is a pub style establishment where pizza is their specialty. They offer chicken and ribs too, and also traditional pub style appies. The next time I’m here, I’ll have to sample. When given the wide choice of toppings for pizza, just what should I get? I opted for the #10, with Anchovies, roasted garlic, marinated tomatoes, olives, mozza on tomato sauce. My muscle memory is already salivating and I enjoyed the combination. With this particular fish, the taste can be overpowering especially when too much is used. The talent behind the kitchen got the mix just right. The plate used to hold the pizza keeps the heat around so none of it tastes cold. The service was good. Sometimes I had to make a psychic shoutout that I wanted a refill of water, and they heard. The place has a rustic tone to it, to make relaxing here easy. Had I not have to worry about the long bus commute back home on a lazy Sunday, I’d say here longer and enjoy the ambience. A walk down to the dock and boardwalk would have made being here all the more pleasant. Usually, when I drive down Cook Street near Royal Athletic Park, I take mental note of the eateries. When the side streets do not offer a lot of parking and the lots in the strip malls are just as minimal, to find a place to stop is not easy. A walk along this street which defines the border between North Park and Fernwood has quite a number of lovely stops. Sadly, a few operations come and go quite fast. 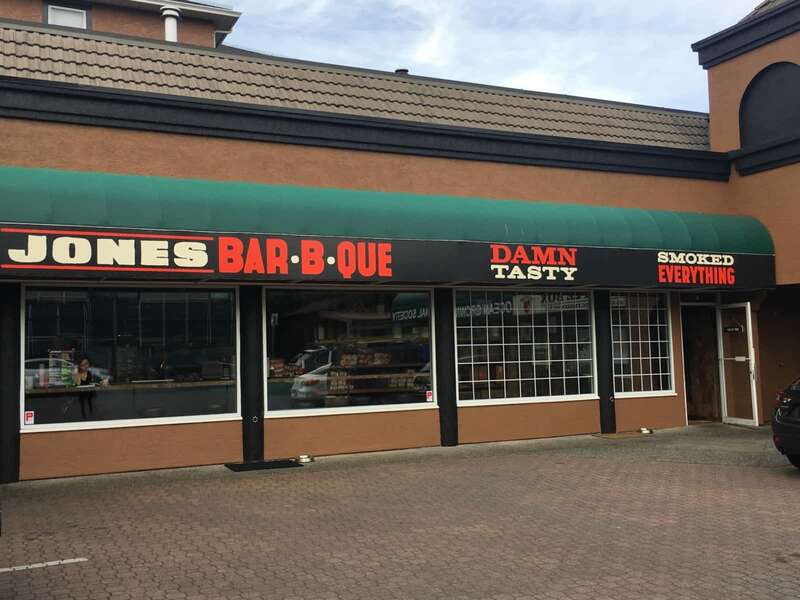 I hope Jones Bar-B-Que is here to stay. This city needs a proper BBQ joint. When the craving hits for simple smoked flavours, I should not be waiting for Rib Fest in Esquimalt come Fall. I can stop by this eatery anytime. I’ve been Jonesing for it for quite some time. I’m sure that is the reason behind this diner’s name, and they offer fantastic fixin’s and I’m sure my Texan friend Susan will give a seal of approval to. She lives on this island now, and I see her from time to time, and I love hearing her stories of life and the tastes from down South.